We open this blog post with a few "Arrows for Your Quiver" and then go into a particular quality, called "Suspending Certainty" in detail below. Keep in mind these tools can be applied both in business and personal life. We hope you are inspired by this conversation and strongly encourage your posts and comments! 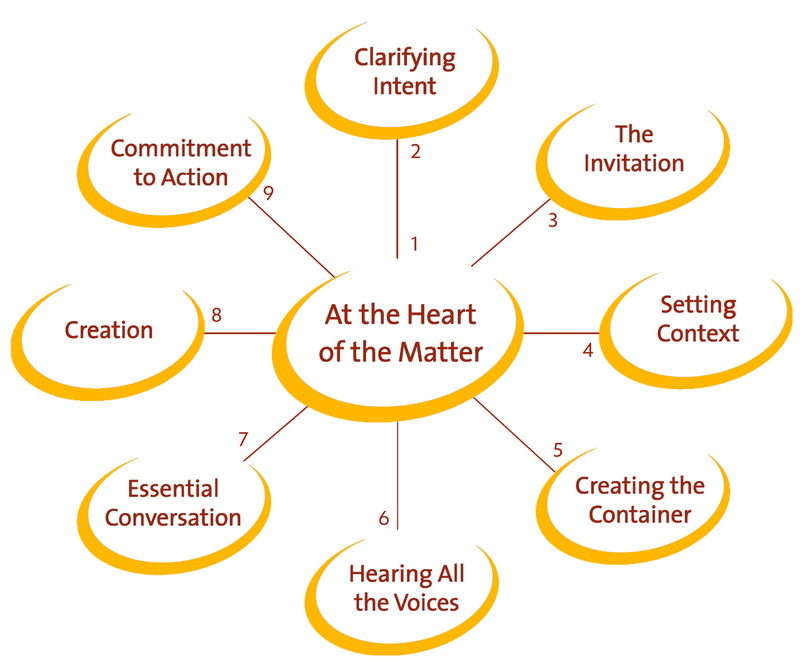 Wisdom Circles are an effective and efficient way for any small group breakout session, to get to the heart of the matter in any gathering. • Each person speaks in turn moving clockwise around the circle. • Do a second round; or, open the circle for insights and reflections. • Notice the difference between advice (talking at) and wisdom (being spoken through). • Speak only if you wish; you may pass at any time. • Listen deeply for the wisdom that is emerging. • Allow a pause between each person speaking. What is on your mind/heart? Be aware of your judgments. Honor the questions and the inquiry.
. . . and, you can always take back what you said. The above key principles potentially provide a multitude of opportunities for unpacking the experiences that create a very successful and creative, safe, container. Let's pick one of the above and spend a moment with it: "Suspend Certainty". When we think about this act and conceptualize its function, it is amazing the discoveries we make. Oftentimes we are unawares of the rote ways we go about things until we simply take time to place our attention on something specific--in this case--the energy that precedes us in approaching a meeting or engagement. What are you certain about in regards to this meeting or interaction, including the people involved? Do you have a wide range of variance in your certainty and beliefs about the meeting and people involved? Notice the stronger, more solid beliefs. Notice the ones that seem less boundaried. Can you trace the origin of these beliefs or certainties back to the root? What do you discover? Perhaps you might be surpised--or even astonished--at the wide array of findings in simply contemplating these questions the next time you are approaching any kind of interaction--business or personal. In the Japanese tradition of Zen, there is reference to what is called Beginner's Mind by Master Shunryu Suzuki. When we "suspend certainty" we automatically ignite the energetic of Beginner's Mind which in turn opens us up to new possibilities and very likely will produce results in our meetings that might seem impossible to achieve. When we unwind our solidified certainties and beliefs, and simply take a moment to identify how they came to be, we shift our potential to co-create. But how do I Suspend Certainty? Answer: there is no easy answer. What we can suggest is that the first step is simply the act of honest self-inquiry. Remember, science has proven in the renowned Visual Cognition "Basketball Passes" study that our focus determines what we see and don't see. This experiment involved participants in a double-blind experiment who were asked to watch a short video (watch now before reading on if you want to participate-remember to count the passes the first time you watch it) of a group of 6 people passing a basketball in a circle, and to specifically count the number of passes. After watching it the first time and reporting the number to the Scientist conducting the experiment, they then were asked to specifically not do anything, just watch the video clip. Astoundingly, they discovered that a man in a Gorilla suit walks right through the video, and they did not notice it the first time as they were limiting their attention to a specific task: counting the basketball passes. Is this not amazing? This proves that while we may be "on task" and well intentioned in how we approach our meetings and interactions, if we become too focused we will literally miss something! By the act of placing our attention in "soft focus" and by practicing self-inquiry as to preconceived beliefs and notions, we begin the path of unwinding some of the things that perhaps have kept us from not only optimal productivity in meetings, but moreover a yet-potentiated relationship to our possibilities with ourselves and others in any format. We warmly welcome and invite your comments and would like to hear your thoughts on what works for you in Suspending Certainty or any of the other Principles of Conversation. To being the Beginner's Mind!